After their blowout loss in their last game, Barangay Ginebra beat the Phoenix Fuel Masters, 100-97, to bounce back in a big way. Ginebra locked up the to-seeded Fuel Masters in the clutch to pull out the tight win. Ginebra rises to fifth with a 4-3 record. Phoenix stays in the top spot with only their second loss in 10 games. Late in the third quarter of the game, Calvin Abueva drove to the hoop past Kevin Ferrer. He took the bump against Prince Caperal and lobbed up a shot that dropped in. That shot gave Phoenix a seven-point lead. Ginebra called a timeout as Abueva crossed his throat and flexed his biceps. It looked like Phoenix took control of the game at that point. Phoenix built up a lead as big as eight points early in the fourth period. But Ginebra wouldn’t let them pull away. Japeth Aguilar, Greg Slaughter and Aljon Mariano attacked the inside to cut the deficit down to four. Mariano continued to attack, keeping Ginebra in the game. With four minutes left in the game, LA Tenorio tied the count with a wide-open three-pointer. He followed it up with another booming triple to give Ginebra the lead. Ginebra traded leads with Phoenix until the final minute when Jervy Cruz knocked down two freebies to put Ginebra up by one. They went to Wright again. He shook Thompson’s defense and got to the paint attracting the Ginebra defense. Wright dumped the pass off to a wide-open Abueva underneath. But Aguilar sensed the play and switched quickly from Wright to Abueva. Aguilar met The Beast up top, blocking the shot and saving Ginebra. Mariano was fouled on the loose ball and nailed both freebies to extend Ginebra’s lead to three. With no timeouts left, Wright was forced to throw up a prayer from thirty feet away. The shot rattled out and Ginebra escaped with the win. 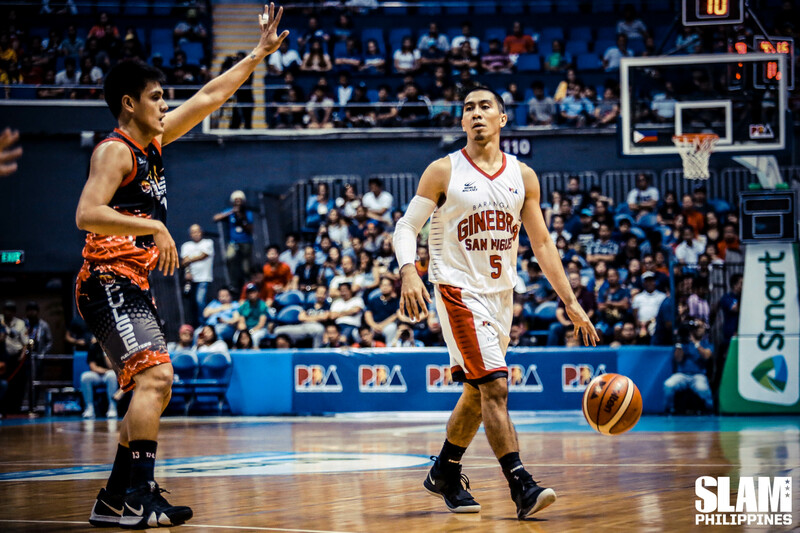 Tenorio led Ginebra with 23 points, eight rebounds and five assists. He also tied Alvin Patrimonio for most consecutive games played at 596. Mariano added 20 points and nine rebounds while Slaughter had 18 and 11. Abueva led Phoenix with 15 points and 11 rebounds. 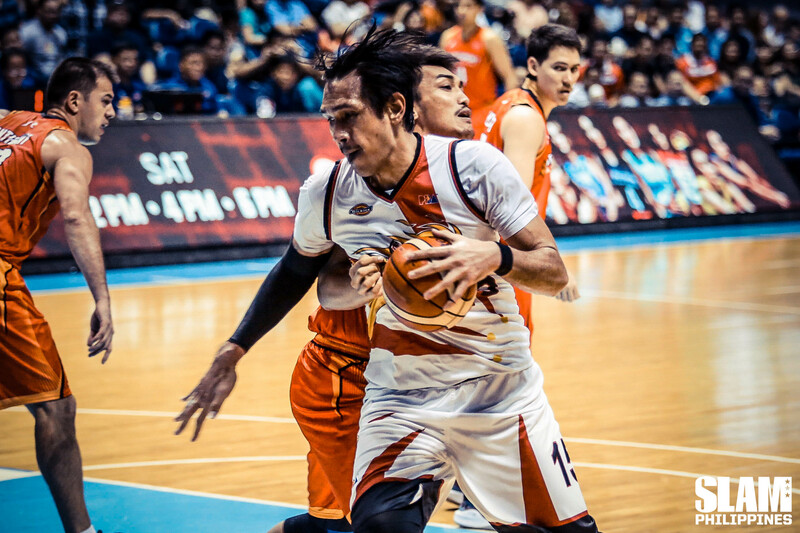 In the first game, June Mar Fajardo showed once again that he’e the most dominant player in the league. He carried the San Miguel Beermen to their fourth straight win, 113-107, against the NorthPort Batang Pier. San Miguel takes up solo third with a 6-3 record. NorthPort stays near the bottom of the standings at 2-5. With most of the Beermen’s starters having an off shooting night, Fajardo powered the San Miguel offense with 40 points, missing only one shot from the field. Fajardo shot 93% on 15 shots. He also had 19 rebounds to round out his impressive stat line. Terrence Romeo came off the bench to add 23 points on 61% shooting. Mo Tautuaa led NorthPort with 28 points. The game was tight in the firs half. NorthPort took advantage of the Beermen’s shooting woes to take a four-point lead into the second half. The Kraken woke up in the third period. He scored a basket inside to open the second half. After shots by Romeo and Marcio Lassiter, Fajardo added back-to-back buckets to reclaim the lead from NorthPort. Fajardo continued to dominate in the paint, leading San Miguel to a 15-point lead midway through the third period. The Batang Pier tried to make one last run in the final period. Behind Sean Anthony, Stanley Pringle and Tautuaa, NorthPort got to within two points in the final minute of the game. But Fajardo decided to shut the door on NorthPort. He got fouled in the paint and knocked in two freebies to increase the lead. He followed that up with the dagger jumper that increased the lead to two possessions, securing the win.